FACT CHECK: Does This Trump-Loving Celebrity Want Critics to Move Out of the United States? Does This Trump-Loving Celebrity Want Critics to Move Out of the United States? 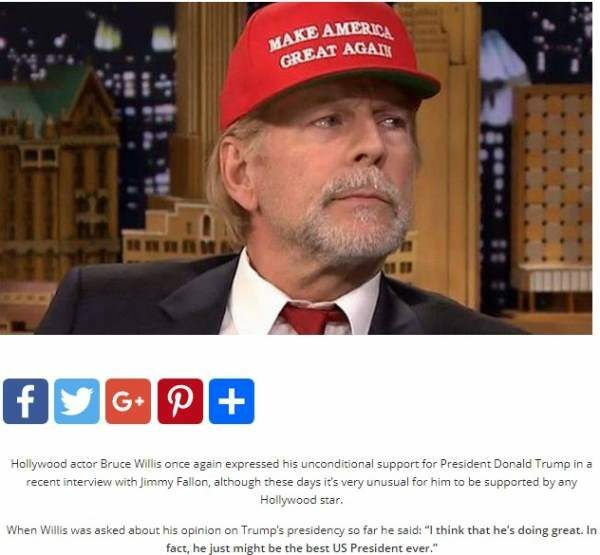 A made-up news story wrongly proclaims Bruce Willis as the latest entry in a line of Hollywood A-listers who have mobilized behind the president. 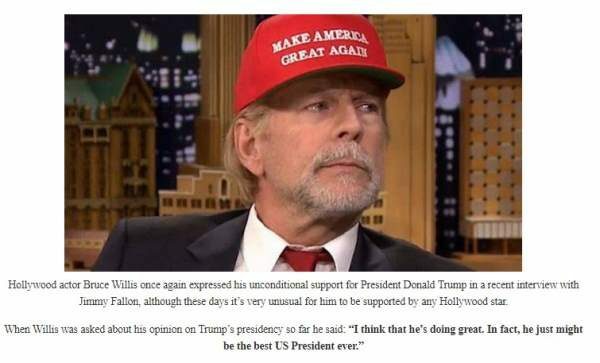 A famous actor defended President Donald Trump and said that people who criticize the chief executive should leave the United States. 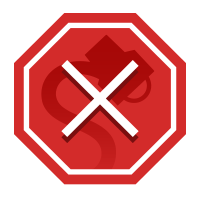 Several disreputable web sites have fabricated stories in 2017 claiming that various celebrities were rallying around President Donald Trump to the point of pushing their own versions of the “love it or leave it” argument. Before every election so far there were debates and fighting between candidates. But, once we had a winner everybody just stood behind the elected President. Now we see that the fighting and conflict continue long after the 2016 election. I don’t like that. It doesn’t look good. If you don’t like him go to Canada or something. It suddenly has just seemed to grow exponentially and … I was a blonde when I was a kid. The bogus post circulated online about a month after similarly shoddy web sites posted fabricated stories claiming that Sandra Bullock had encouraged anyone criticizing Trump (but especially Hillary Clinton) to leave the U.S. Another (similarly untrue) variant of these stories, published on 17 November 2017, was based on the idea that actress Jennifer Aniston wanted to start a “Celebrities for Trump” group.